If there’s one sugar free cake you want to cook well, it has to be your Christmas cake! And by making simple substitutions for your sugar, there’s no reason why this shouldn’t be perfect to slice into throughout the festive period. 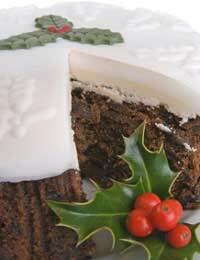 Christmas cake can traditionally be made well in advance but do remember that without the sugar, these versions might not keep quite as long. Store them in an airtight container, however, and they will certainly stay fresh for several days. Oh and don’t forget to call everyone in the house into the kitchen while you are making it. It’s good luck for the whole family to have a stir! This version of the wonderful, heavy, fruit cake contains plenty of delicious spices. By using honey as well, you can create a very warm, wintry flavour. Preheat your oven to 150 deg C/140 deg C/gas mark two. Sieve your flour, salt and spices into a large bowl. Melt your butter and honey in a small pan over a low heat. Pour the hot liquid into the large bowl with your dry ingredients and stir. Beat your eggs and then stir in. Add your dried fruit and peel, and your chopped nuts. Grease a 20cm (eight ins) cake tin and line the bottom and sides with baking paper. Spoon your mixture in, creating a slight dip in the middle as you do. Bake slowly in the middle of the oven for up to three hours. If the top starts looking over-cooked, cover with another sheet of baking paper. Insert a skewer to check if the cake is ready. When cooked all the way through, remove from the heat and leave to cool. To make your marzipan, melt the rest of your honey in a small pan over a low heat. Put your ground almonds into a bowl. Beat your egg then add to the almonds. Slowly pour in your runny honey and almond essence. Mix until smooth and able to be rolled out. Place in the fridge to chill. When you are ready to decorate your cake, spoon on and spread the jam. Roll out your marzipan and completely cover the top and sides of your cake. Leave for at least a day before making your icing. For a sugar free, crunchy version, whisk your egg whites until stiff then slowly stir in your granulated sweetener. Add lemon juice and spread thinly on top. Create peaks using a knife. Once hardened, decorate with Christmas figures. For those who like their Christmas cakes and puddings to have a good splash of alcohol, this recipe is perfect. Instead of sugar it calls for sugar free jam, which combines beautifully with the brandy to add to the rich flavour of the cake. Soak your dried fruit in the brandy for several hours. Preheat your oven to 150 deg C/140 deg C/gas mark two. Grease a 20cm (eight ins) cake tin and line the bottom and sides with baking paper. Cream your butter and jam together in a very large mixing bowl. Add your flour and brandied fruit, and stir well. Spoon the mixture into the cake tin, creating a slight dip in the centre as you do. Bake in the centre of the oven for about three hours or until your inserted skewer comes out clean. Again, if the top starts looking over-cooked, cover with another sheet of baking paper. Remove from the heat when cooked all way through and leave to cool. Make a sugar free, snow-like topping by spreading cream cheese on top. Decorate with Christmas ornaments.